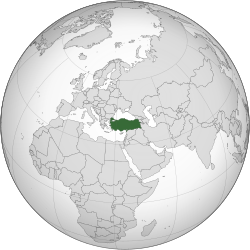 Turkey (Turkis: Türkiye), kent offeecially as the Republic o Turkey (Turkis: Türkiye Cumhuriyeti) is a muckle kintra in Eurasie. It haes laund mairches wi Greece an Bulgarie tae the wast an Georgie, Armenie, Azerbaijan (kent thegither as the "Caucasus" kintras), Iran, Iraq an Sirie tae the east an watter mairches wi the Mediterranean Sea tae the sooth. The kintra wis the centre o the Ottoman Empire that haed owerins ower mony different kintras in baith wast Asie an sooth-east Europe. Houaniver, efter the First Warld War the Ottoman Empire wis malafousterd. It haed been allee'd tae Germany an efter the defeat o thon kintra an it's allees thare wis a brief period o occupation o twa o the kintra's muckle maist ceeties; Istanbul an Izmir bi the Allee'd Pooers. Houaniver, the kintra wis leeberatit unner the heidsmanship o Mustafa Kemal, kent forby as Ataturk (The Faither o the Turks in Turkis) an it becam an unthirlt republic in the 1920s. The caipital o Turkey is Ankara, but its muckle maist ceety is Istanbul that's seetuate in the wast o the kintra an wis historically kent as "Constantinople" an wis the caipital o the "Eastren Roman" or "Byzantine Empire". Turkey haes aboot 74,816,000 fowk in it. ↑ Nae specified bi law, as appears on the Turkis passports, ID cairds an diplomatic missions o Turkey. ↑ 1.0 1.1 "The Results of Address Based Population Registration System, 2014". Turkish Statistical Institute. 29 January 2015. Retrieved 29 January 2015. ↑ 2.0 2.1 2.2 2.3 "Report for Selected Countries and Subjects: Turkey". IMF World Economic Outlook Database, April 2015. 14 April 2015. Retrieved 21 April 2015. ↑ "2014 Human Development Report" (PDF). 14 March 2013. pp. 21–25. Retrieved 27 July 2014.